Doctor of Osteopathic Medicine Carrie Nelson has a calling: to help the Blackfeet Indians by volunteering at the tiny federal hospital outside of Glacier National Park and studying native medicine. Now the prestigious Roosevelt Award will cover her expenses and fund her research for a year. To her dismay, her father and her fiancé believe she is squandering her future. Both doctors, they want her back in Philadelphia, working in her father's comfortable practice. Inspired by her beloved grandmother, a trail-blazing doctor who believes in holistic medicine, Carrie holds her ground. She resists her fiancé's stealth campaign to bring her home and falls in love with the Blackfeet people, the local medicine woman, and the spectacular though harsh land itself. Then there is Nate, the gifted young surgeon drawn to this remote area in Montana by a mysterious past. Says Strachan, "This novel was inspired by the work of a dedicated group of volunteer physicians who go to the Blackfeet Indian reservation each July to provide care that otherwise wouldn't be available in such a remote location. After visiting the reservation, experiencing the grandeur of Glacier National Park, and seeing the Blackfeet Medical Corps in action, I was certain readers would love the story of a young female physician who devotes her life to the Blackfeet people." Listening for Drums is a contemporary fiction novel written by Robin Strachan. Dr. Carrie Nelson was getting ready to leave the Blackfeet Reservation in Northwest Montana once again. This was not the first time she would leave after completing her week as a volunteer with the Blackfeet Volunteer Medical Corps, but she was leaving knowing she’d soon be back to stay for a full year. While there, she had gotten word that she’d won the prestigious Roosevelt Award, which included a $50,000 stipend. The award, which honored Eleanor Roosevelt, was designed to continue Roosevelt’s efforts on behalf of medically underserved persons in the United States. Winning the award meant Carrie could spend the next year working at the tiny federal hospital which served the Blackfeet community. She couldn’t wait to spring the good news on her gran, her parents and her fiance, Tom; after all, this was a significant accomplishment and an honor. When she got home, she held in her news until the five of them were at dinner. Gran was, predictably, thrilled by the news and excited for her granddaughter’s accomplishments and plans for the year. Tom and her father were not. She was greeted with anger and a sense that everything had already been planned out for her and her future, regardless of her desires or feelings. Nothing seemed to make any sense, and she was both relieved and saddened as she left Philadelphia once more and was en route back to Montana. 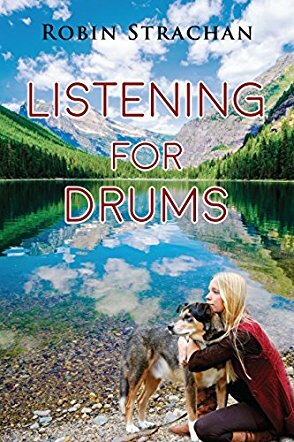 Robin Strachan’s contemporary fiction novel, Listening for Drums, is an enthralling and fascinating look at the work the Blackfeet Volunteer Medical Corps accomplishes each year as seen through the eyes of a young osteopath who defies her overbearing father and controlling fiance to determine her own future. Strachan’s story bears the ring of authenticity the author gained through her own participation in the Corps and her research on the Blackfeet Nation, Native American medicine and the Glacier National Park region. The result is a story that kept me engaged and happily reading. I’ve long had an interest in natural healing and loved reading about the intersection between traditional and Western healing as both are practised in the area. Dr. Carrie Nelson is a marvelous character whose story feels quite like a coming of age tale as the twenty-eight-year-old strikes out on her own, despite the vigorous disapproval of her father and the threats of her fiance. Seeing Glacier National Park and north-western Montana through her eyes is marvelous, and the lives she interacts with as Dr. Golden Hair are unforgettable. Listening for Drums is most highly recommended.